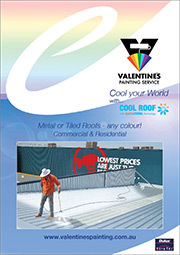 Valentine’s Painting Service can also rejuvenate your tired tin or tile roof. From re-pointing ridge capping and replacing broken tiles, to rust treating bolts, we can cover every aspect of preparation and painting of your workshop, home or office roof. We can offer various options for painting products, however we highly recommend the Dulux CoolRoof, thermal coating system. A revolutionary coating that not only looks great, but actually reflects the sun’s rays, preventing heat from entering the roof. If you are concerned about rising power costs, and your environmental impact, then CoolRoof is well worth your consideration. The brochure on the left will explain in more detail how the system works, and the heat prevention properties meaning a cooler home, office or workshop and less air conditioning costs for you.